Bundles are a combination of inventory items, which do not include accommodation. Bundles are useful when you offer multiple items at a different price than the sum of these items would be when added together. For example, you want to offer a bundle of 5x Surf Lessons and 3x Yoga Lessons, but at a cheaper price when all these activities are booked together. 4. 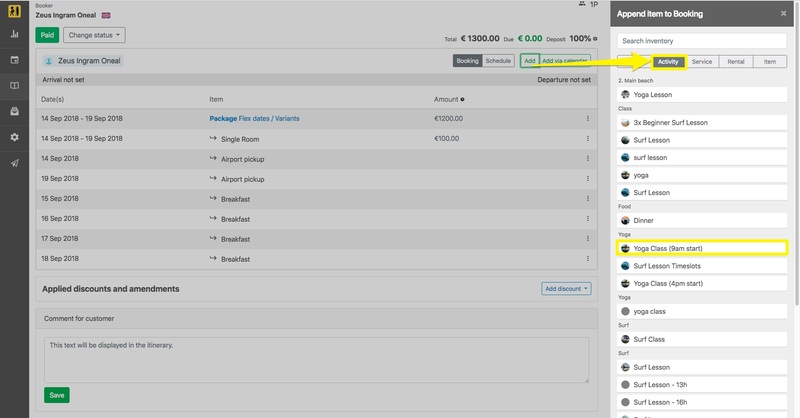 First, assign this new Bundle to an existing Backoffice Category (or make a new one). Then, give this Bundle a Title and select one of the pricing options. Hit Save. 5. 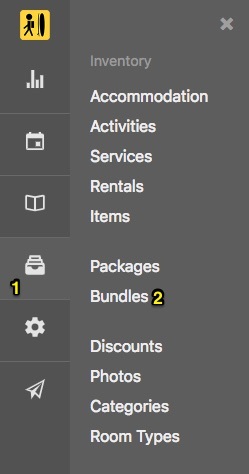 In the Configurations Tab of your Bundle, select the items you want to add, and in which quantity you want to add them. In the example below, we added three Yoga Classes to this Bundle. You can set a price point in the Pricing Tab on this page. Now, you can offer this Bundle as a single product in your Frontoffice or add it as a Package Item. Open a Package and navigate to the Package Contents tab. Click on Add an item > Bundles. Now, a list of all your Bundles will display. Click on the Bundles you wish to add to the package. Don't forget to configure this Package Item by clicking on the Bundle. 1. Open the booking and click on the "Add" button. 2. Select an Inventory Item that is part of a Bundle. 3. A Bundle option will come up and you will be able to select between the bundles that contain the selected inventory item.